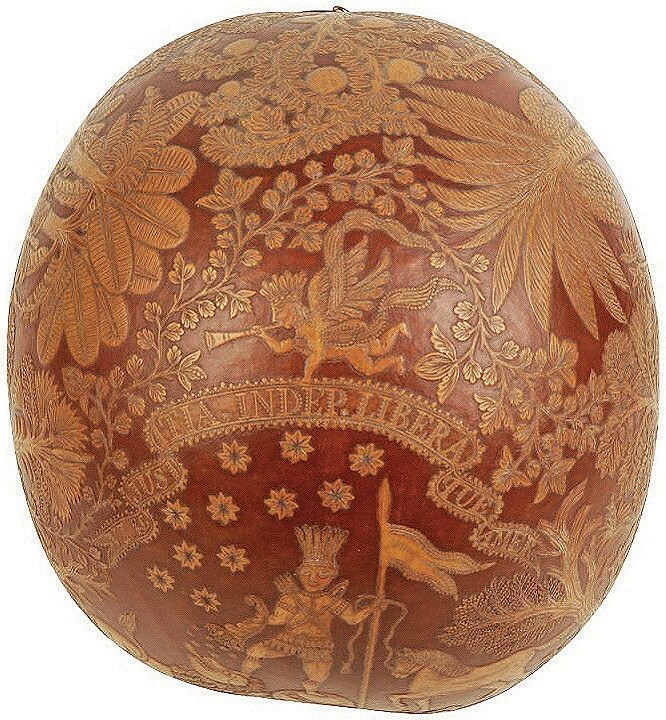 This exotically carved folk art gourd above was possibly made to commemorate the US Declaration of Independence in 1776. The 11½in (29cm) long piece is inscribed in Latin VI JUSTITIA INDEP. LIBERA QUE AMER and depicts a native American crushing the British imperial lion under one foot. The figure also holds an upturned cornucopia in one hand and a flag and a tethered horse breaking a flaming torch or staff under its hoof in the other. Above the figure is a flower head motif, possibly depicting the 11 stars of a confederate flag. Duke’s of Dorchester in Dorset has guided the piece at £2000-3000 in a sale of coins, antiquities, tribal art and militaria on February 14. 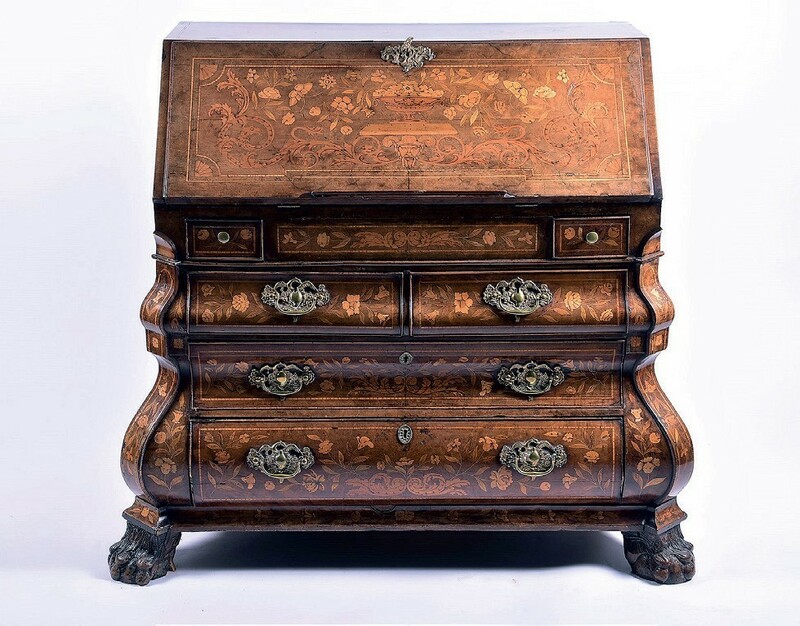 An 18th century Dutch walnut and floral marquetry bureau is estimated at £2000-3000 in an auction at Dawson’s in Berkshire on February 23. Measuring 3ft 6in x 3ft 11in (1.08 x 1.2m) wide, the serpentine-form piece is supported on stylised lion paw feet and has floral marquetry throughout. The fall opens to reveal a concealed interior with stepped drawers either side and a secret slide drawer. Still preserved in its original black frame, this flambé glazed plaque by Royal Doulton artist Charles Noke above will be offered at Peter Wilson of Nantwich in Cheshire on February 14. It is estimated at £1500-2500. 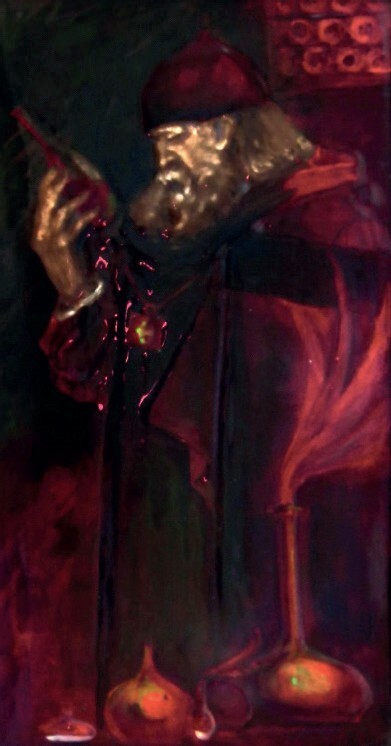 The robed alchemist, shown here with a cross around his neck and standing before a window studying a bottle vase, appeared in advertisements for Royal Doulton’s Old Sung and Chang wares. An entire Glasgow School Arts & Crafts mahogany bedroom suite by Ernest Archibald Taylor (1874-1951) is estimated at £2000-3000 in a fine art sale at Shrewsbury auction house Halls on February 20. 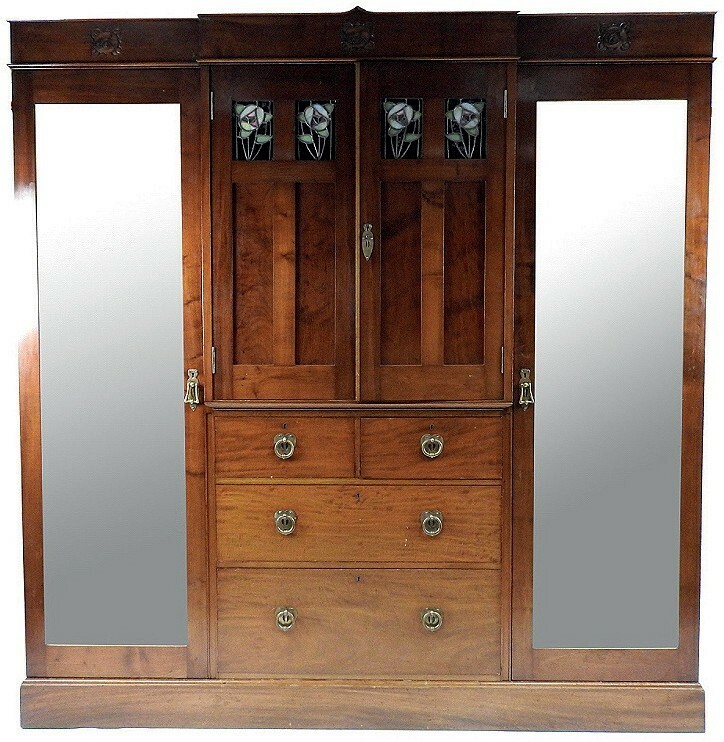 The seven-piece group comprises a 6ft 6in x 6ft 9in (2 x 2.07m) mahogany mirror door wardrobe (pictured above), a triple-mirror dressing table, a tile-top washstand, towel rail and two bedroom chairs. The Greenock-born Taylor studied at the Glasgow School of Art and was employed by the cabinet-maker Wylie and Lochhead, winning acclaim at the 1901 Glasgow International Exhibition. He married Jessie Marion King (one of the ‘Glasgow Girls’) and together they moved to Paris where they established an art school known as the Shearling Atelier.